Top Hat Blueberry simply has to be seen to be believed. Here is a beautiful, moundshaped, compact shrub that is ideal for containers and small spaces, loaded with so many flowers in spring it looks like a white-flowering heather, followed by hundreds of delicious full-size blueberry fruits that make it doubly decorative. Top Hat is also becoming a favorite of bonsai enthusiasts, since the plant so easily allows itself to be restricted in a bonsai dish and shaped into a decorative bonsai accent, even flowering and fruiting as a bonsai accent. Developed from a breeding program at Michigan State University by one of the country's leading blueberry specialists, plants are cold hardy and easy to grow. Round, firm, flavorful fruits are a dusky blue just like those you find in the stores - perfect for fresh eating, making jam and baking into muffins or pies. Blueberries are valued for their ornamental foliage, flowers and berries. Their small bell shaped flowers contrast beautifully with the leathery leaves during the spring and summer and are followed by edible round berries which turn purple when ripe to eat. 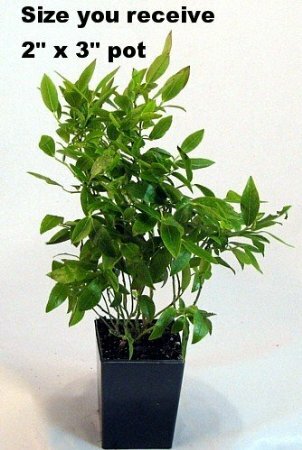 The plant you will receive is growing in a 2" x 3" growers pot. It is well branched and about 8" tall.